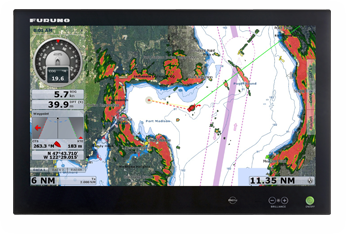 The FURUNO MU245T is a 24” Wide Screen, multi-purpose, multi-touch marine LCD that features the unmatched quality and reliability that you have learned to depend on. The MU245T utilizes Projected Capacitive Technology (called PCTouch) to provide the ultimate in responsive sensitivity for the NavNet TZtouch black box system. The MU245T employs an extremely bright (1,000 cd/m2 ) color TFT Active-Matrix LCD with LED Backlight Technology. With its bright colors, excellent contrast and wide viewing angles, the MU245T monitor is perfect for any tropical sunlight or low light conditions. Furthermore, the LCD and the glass are bonded together to ensure fog free operation on open fly-bridge installations. The MU245T features native 1920 x 1080 screen resolution, and can auto-detect a wide variety of common screen resolutions with its built-in scaler. Its wide range of interface options include 1 Device Port 1.2, 2 DVI (Digital Video Interface) and 2 composite video inputs, and one 15-Pin D-SUB VGA Out port..The display is the perfect match for the NavNet TZtouch and TZtouch2 series, but can also display images from security cameras, DVD player, computers, HDTV Receivers or other peripheral devices. The MU245T display offers enduring quality for system integrators and boat builders, particularly where reliability and long life time are key prerequisites. The product range combines stunning design and technology with innovative features and options, making it all that the integrator needs for top class, type-approved marine systems.